You are here: Home / Blog / It's going to be a POW year and we're ready! It's going to be a POW year and we're ready! While some folks are still disillusioned about last year's ski season, we're convinced that this will be a year to remember! While some folks are still disillusioned about last year's ski season, our team at Stevens Lodge is 100% convinced that this will be a year to remember...and we are doing lots of work to prepare the lodge for an epic season! September was a great month for our lodge's group revenue channel. We hosted four different groups, from a private corporate retreat to a rescue course - our team stepped up and had the lodge ready and provided a great experience for these folks. It was a great volunteer effort, with folks giving up summer weekends and using work vacation days to accommodate the rigorous schedule. A group of volunteers scrubbed down the cabin during the last weekend in August to prepare for the groups. In October and November, we will be refurbishing our main level floors by sanding and oiling the original wood and installing new carpeting in our main living area. Last weekend, we felled a tree, bucked the rounds, and split and stacked more wood. We'll have more weekend to finish off the living area and a few small projects in one of the next few weekends. If you'd like to help out, please shoot an email to StevensLodge@outlook.com and we'll get you the details. It takes a village to run a ski lodge and we have a great team set up but we are always looking for more folks to help out. Our core team works at least one work party, attends the mandatory training event in December and staffs 2-3 weekends a season. With this commitment, a lodge pass is provided for the season. While we are currently staffed for all of the weekends we are seeking volunteers to manage group bookings and finances. If you are interested, please email StevensLodge@outlook.com. It's going to be a great season! 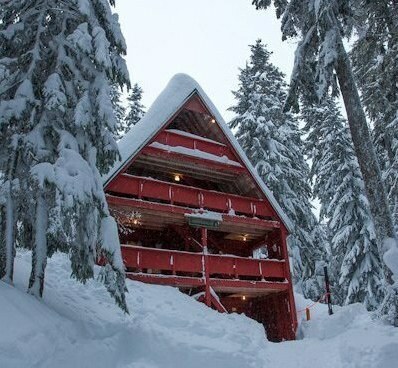 We hope to see you at the lodge this winter!